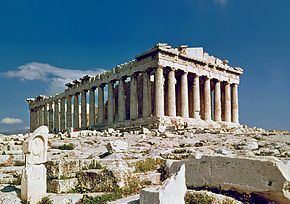 The Parthenon in Athens, Greece, was built for the goddess Athena in 447–432 BC and remained devoted to her cult for nearly a thousand years, later serving as a Christian church and then as an Islamic mosque under the Ottoman Empire. A place of worship is a specially designed structure or consecrated space where individuals or a group of people such as a congregation come to perform acts of devotion, veneration, or religious study. A building constructed or used for this purpose is sometimes called a house of worship. Temples, churches, synagogues and mosques are examples of structures created for worship. A monastery, particularly for Buddhists, may serve both to house those belonging to religious orders and as a place of worship for visitors. Natural or topographical features may also serve as places of worship, and are considered holy or sacrosanct in some religions; the rituals associated with the Ganges river are an example in Hinduism. Wat Chana Songkhram is a Wat or Buddhist temple in Bangkok. Chartres Cathedral is a cathedral of Roman Catholics in Paris. Great Synagogue of Plesin is a Jewish synagogue in Plesin. Elevation Church, affiliated to the Southern Baptist Convention, in Ballantyne, Charlotte, United States. The Temple of Hercules Victor is a Roman temple in the Forum Boarium , Rome. Ratneshwar Mahadev temple and other Hindu temples along the Manikarnika Ghat of Ganges. Jamkaran Mosque is a mosque of muslims in Iran. A man prays at the Western Wall, a Jewish site in Jerusalem. Golden Temple is the holiest Sikh Gurdwara, located in Punjab, India. Holy See temple is a Cao Dai temple in Vietnam. Ujigami Shrine is a Shinto shrine in Uji, Kyoto Prefecture. The word church derives from the Greek ekklesia, meaning the called-out ones. Its original meaning is to refer to the body of believers, or the body of Christ. The word church is used to refer to a Christian place of worship by some Christian denominations, including Anglicans and Catholics. Other Christian denominations, including the Religious Society of Friends, Mennonites, Christadelphians, and some unitarians, object to the use of the word "church" to refer to a building, as they argue that this word should be reserved for the body of believers who worship there. Instead, these groups use words such as "Hall" to identify their places of worship or any building in use by them for the purpose of assembly. Chapel ("Capel" in Welsh) – Presbyterian Church of Wales (Calvinistic Methodism), and some other denominations, especially non-conformist denominations. English law once reserved the term "church" to the Church of England. In Catholicism and Anglicanism, some smaller and "private" places of worship are called chapels. Latter-day Saints use meeting house and temple to denote two different types of buildings. Normal worship services are held in ward meeting houses (or chapels) while Mormon temples are reserved for special ordinances. Protestant denominations installed in France in the early modern era use the word temple (as opposed to church, supposed to be Roman Catholic); some more recently built temples are called church. an Orthodox temple is a place of worship with base shaped like Greek cross. Kingdom Hall – Jehovah's Witnesses may apply the term in a general way to any meeting place used for their formal meetings for worship, but apply the term formally to those places established by and for local congregations of up to 200 adherents. Their multi-congregation events are typically held at a meeting place termed Assembly Hall of Jehovah's Witnesses (or Christian Convention Center of Jehovah's Witnesses). 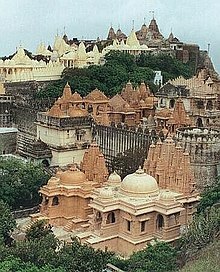 The main place of worship is called a "Mandir"
Some people call it Hindu temple. Tha name Mandir comes from Sanskrit and means house, temple or palace. Hinduism has no set day of worship each week, there in no rules about when Hindus go to the Mandit. They visit the Mandir when ever they feel the need to. Shoes are removed before entering. The symbolism and structure of a Hindu temple are rooted in Vedic traditions, deploying circles and squares. A temple incorporates all elements of Hindu cosmos—presenting the good, the evil and the human, as well as the elements of Hindu sense of cyclic time and the essence of life—symbolically presenting dharma, kama, artha, moksa, and karma. A Mosque (/mɒsk/; from Arabic: المسجد Al-masjid‎) is a place of worship for followers of Islam. There are strict and detailed requirements in Sunni jurisprudence (fiqh) for a place of worship to be considered a masjid, with places that do not meet these requirements regarded as musallas. There are stringent restrictions on the uses of the area formally demarcated as the mosque (which is often a small portion of the larger complex), and, in the Islamic Sharia law, after an area is formally designated as a mosque, it remains so until the Last Day. Many mosques have elaborate domes, minarets, and prayer halls, in varying styles of architecture. Mosques originated on the Arabian Peninsula, but are now found in all inhabited continents. The mosque serves as a place where Muslims can come together for salat (صلاة ṣalāt, meaning "prayer") as well as a center for information, education, social welfare, and dispute settlement. The imam leads the congregation in prayer. One should try to keep as silent as possible inside temple. Mobile phones should not be used in the temple. Some synagogues, especially Reform synagogues, are called temples, but Orthodox and Conservative Judaism consider this inappropriate as they do not consider synagogues a replacement for the Temple in Jerusalem. Some Jewish congregations use the Yiddish term 'shul' to describe their place of worship or Beyt Knesset ( Hebrew בית כנסת ) meaning house of assembly. Fire temple - All Zoroastrian temples fall into the Fire temple category. Nhà thờ họ. Historically speaking Vietnamese people venerate their ancestors, as they somehow still exist among them. However, there is a large diversity of religions in Vietnam, Christianity, Buddhism and Cao Dai religion. ^ "The New Testament Definition of the Church". Retrieved 23 June 2009. ^ Gee, Matthew (8 May 2009). "Meeting for Church Affairs". The Friend. London, UK. 167 (19): 8. ISSN 0016-1268. ^ Stella Kramrisch (1946). The Hindu Temple. Motilal Banarsidass. pp. 19–43, 135–137, context: 129–144 with footnotes. ISBN 978-81-208-0223-0. ^ Klaus Klostermaier, The Divine Presence in Space and Time – Murti, Tirtha, Kala; in A Survey of Hinduism, ISBN 978-0-7914-7082-4, State University of New York Press, pp. 268-277. ^ George Michell (1977). The Hindu Temple: An Introduction to Its Meaning and Forms. University of Chicago Press. pp. 61–76. ISBN 978-0-226-53230-1.